The Family Medicine Residency Training Program is an innovative, developmental curriculum that integrates behavioral science, social medicine and community involvement. 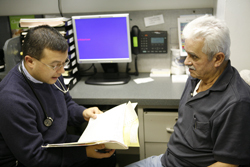 This track trains family physicians who excel in providing the highest quality clinical care. The program's goal is to train family physicians prepared to meet the needs of diverse, urban underserved patients and communities and to be leaders, scholars, teachers and advocates for health equality and social change. Williamsbridge Family Practice, serving predominantly working-class Caribbean Americans and other immigrant populations in the Northeast Bronx.